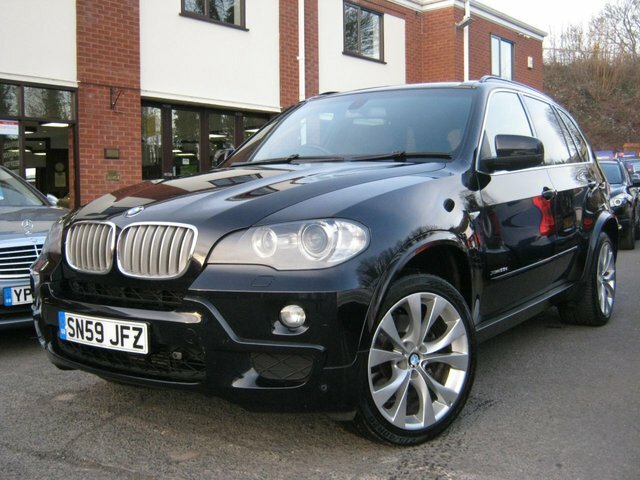 This breath taking 2009 59-Reg BMW X5 3.0D 35d Auto M-Sport looks and drives excellent,presented in unmarked metallic midnight blue with full black leather sports trim,it has covered just 97,000 miles and comes with FSH, it must be one of the nicest specifications you will find at this price with extras including full sports electric memory black leather trim,heated seats,Xenon headlamps,cruise control,climate control,electric folding mirrors,reverse camera with 360 degree view,auto lights and wipers,factory fitted widescreen sat nav and bluetooth phone prep,front and rear parking sensors, USB/Aux interface,multi cd player and 21" alloy wheels,immaculately presented inside and out and first to see will buy!!!! Rugged and well built, the BMW X5 is an SUV designed for drivers who aren't prepared to compromise. Offering considerable road presence and an elevated driving position, a used BMW X5 is outstanding on all surfaces and will always ensure you reach your destination in comfort and style. A choice of economical diesel engines help to keep running costs down and the considerable interior space guarantees plenty of room for the whole family. Discover more by contacting a member of the team at BJH Motors and Sons today, and take the opportunity to browse our complete range of used BMW X5 models for sale in Worcester here on the website.